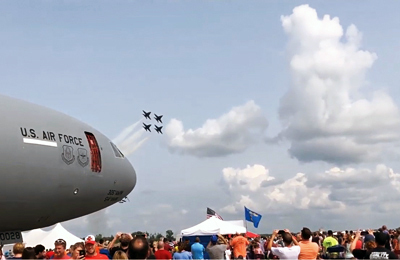 Every summer, thousands of people travel to western Indiana for the Terre Haute airshow—a two-day event that features the Navy’s famous Blue Angels and other aircraft. While pilots spend months preparing to perform daring tricks in the air, public safety and state and local officials spend months preparing for the event on the ground. With several local, state, and federal first responders supporting the event, organizers for the 2018 event were looking for ways to enhance public safety communications. They decided to deploy FirstNet to provide a robust interoperable broadband connection for all involved. Despite months of careful planning, event organizers could not predict the torrential rains that would fall days before the event or how the weather would impact the response and communications that followed. With grass parking lots flooded, organizers had to turn thousands of visitors away, many of whom turned to their devices to express their frustration. With parking lots flooded, many visitors parked miles away and traveled to the event by foot. But as temperatures reached triple digits, several visitors suffered from heat exhaustion. First responders were able to depend on FirstNet’s “always-on” connection as they managed the influx of medical emergencies that ensued from those conditions. “Everything that you need is embedded within FirstNet to give responders the tools that they need to communicate, ultimately keeping them safe,” said Clements.